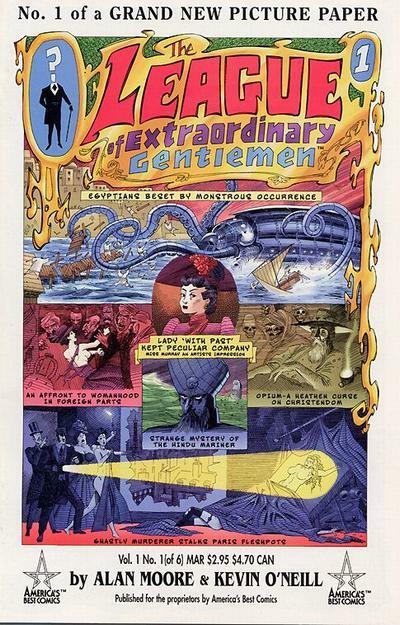 Last week the Spotlight featured a great post from 1st time guest writer Readcomix. One of the comments left on his post was that his pick was too difficult to find. At least he wasn’t sadistic enough to pick Better Comics #1 or Motion Pictures Funnies Weekly. 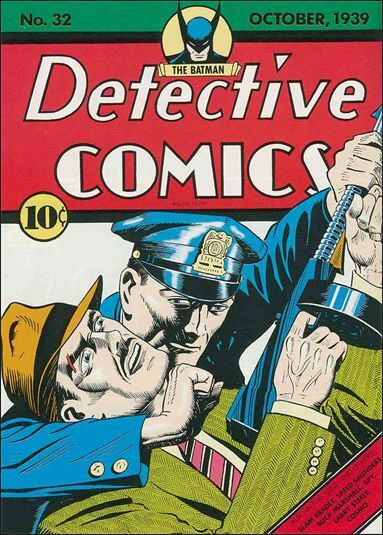 Not that Readcomix needs defending but the Spotlight should cover old and new, scarce and plentiful. A good mix keeps us guessing, a tough book keeps us dreaming. Nonetheless I made a note to pick a more readily available comic for this week. A couple of years ago Charlie Kim left a comment on one of my posts that really stuck with me. I forget which post but Charlie brought attention to the fact that not enough people collect classic arcs and runs, that collecting these compact runs should be a viable collecting option. To be honest up until then I thought more along the lines of – the old guys collect the title runs – and the newbies focus more on individual key issues. The thought of the classic run or arc eluded me. The Frank Miller Daredevil run, The Dark Phoenix Saga arc in the X-Men are examples of what Charlie was referring to. Each of these runs and arcs have issues in them that are heavily collected, like Daredevil #168 (1st Elektra) or X-Men #129 (1st Kitty Pryde). But the premise of the arc or the run being collected has you hunting down say Daredevil #168 to #181 (into Elektra to death of Elektra), a good plan if you ask me. I finally got around to watching some of Season 2 of Daredevil on Netflix and so far I’m liking it. As I was watching it I thought of the Alex Maleev Daredevil run he did with writer Brian Michael Bendis. The series has that gritty aesthetic that I used to like about the Maleev stint in the comic. So as you can see there was no escaping this week’s Spotlight pick. Inspiration came from everywhere, from a comment on last week’s Spotlight, from a long ago comment left by CBD writer Charlie and from me being bored one night and checking out some Netflix. These 3 thoughts crossed paths directly over this week’s Undervalued Spotlight, Daredevil Vol. 2 #26. 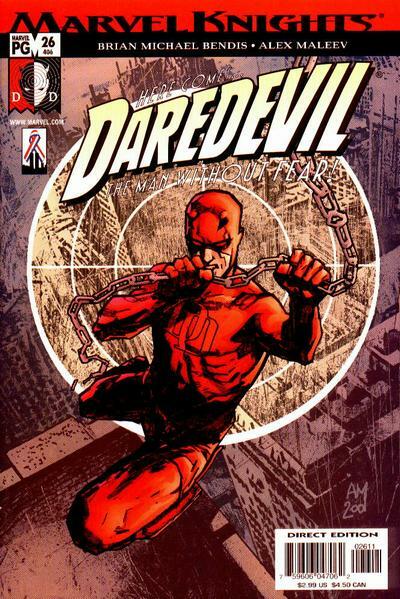 Brian Michael Bendis and Alex Maleev spent over 4 years on the Daredevil title, 55 issues in all ending with #81. What they left behind was an important and massively influential body of work that shapes the character still today. These stories were crime drama stories focused on the daily humanity of the flawed hero in the unforgiving setting of gritty streets and dark dirty alleys. In a way Bendis and Maleev removed Daredevil from the larger Marvel U and put him where he belonged. The last CGC 9.8 copy of Daredevil Vol. 2 #26 sold for $22. Comichron has the distribution figure for this issue at 56,566 which is relatively small and consider that fact that most of these have been floating around in bargain bins for the last 15 years you might be surprised how hard it will be to hunt one of these down. Make sure it’s square, centered and tight! The 46th Overstreet price break for this book is $3.50 in the 9.2 grade split. Nice pick. I’ve been a Daredevil fan since I was in short pants, but that run, and the Brubaker and Lark (among others) run from 82-119 & 500 are amazing. To me these books represent the quintessential run of the book. I’ve long held that Miller may have been a good writer on Daredevil, but his work really suffered minus the brilliant artwork of Dave Mazzuchelli. I have always been more of a selectivist than a completist, and I’m quite happy to have the best parts of a series at the expense of the dogs. On a side not, I had a frantic fan phone me a while back to see if I had a copy of Daredevil 58 from that run which he would gladly drop twenty bucks on. Knowing damn well that the book was available for three, I quickly picked one up. “Bet you can’t even guess why it’s important. Huh? Can yuh? Huh?” Well, actually, having finished the Bendis and Maleev run quite some time ago, I knew that issue was the first appearance of the modern Night Nurse, who, apparently is expected to have a key role in the TV show. Not being a fan of comic book movies or TV shows, I really didn’t care, but I notice the book has been selling on Ebay anywhere from 15 to 50 dollars, so it is probably another one of those sleepers from this run. I’m glad you touched on these books, since, to me, they are, by a long shot, among the very best books Marvel has ever produced. I think I might have been talking about “key” runs. A continuous set of issues in a larger series that really help to re-define and elevate a title. DD was essentially a “B level” character until Miller took the reins. We rarely see this with modern comics. It could be that all the ideas have been “juiced” out or that good ideas appear flat do to the proliferation of so many talented people entering the comic biz. Mel… I know that Miller is recognized more for his writing but I think his art is just as brilliant. He brought cinematic sensibilities into comics, treating the panels like storyboards, and a post-impressionistic style that broke free from the “house” requirements of Marvel and DC. His art was not about detail or accuracy, as it was with guys likes Neal Adams, but rather an “impression” created through light and shadow, which was an effective way to create atmosphere. It’s hard to say how these newer books will pan out as a long term investment but if you’re gonna play the spec game, it makes sense to select books with a selling point. I’m not sure that Bendis and Maleev created anything radical during their tenure but their first book is something that can definitely be highlighted. I can almost guarantee that slagging Miller will get me in trouble every time. I really did like his layouts, though highly derivative of Steranko’s , but I also thought he would have been relegated to even lower ranks if not for the inking of Klaus Janson. I just find his figures very static and chunky, but not, I might add, insubstantial. I also think fans would be well-advised to check out Michael Lark’s art on the run. He took realism in comics to a whole new level, and, surprisingly, far different from the Ted McKeever clone he started out as in the Caliber days. And another standout was David Mack’s Wolverine/Echo arc. It is also a point of pride for me that Bendis, Mack and Lark are all fellow Caliber alumni. It was fun to swim in the same pond as the big fish, even for a short time. Ha… Miller does still have a huge following, but he lost me after DK2. I do like Sin City but I find it brutal to look at. I think the Miller/Janson team up is a write-up in itself. Many pencillers have benefited greatly from being paired with the right inker, including the Byrne/Austin combo and Joe Sinnott with pretty much anybody, which is a nod to having the right chemistry. Yeah, that’s me. As a huge fan of comics as a kid (and into my sixties), it was a great thrill to be able to write a few, albeit largely short stuff for anthology titles like Caliber Presents and Negative Burn. Also, because my cousin Rick uses so much photo reference for his comics work, and because much of the work we have collaborated on is autobiographical my ugly mug has even shown up in a number of comics. So, be warned! And, yeah, I think a good or bad inker can make or break even the greatest of pencillers. Just look what a George Roussos could do to a Kirby! Lord, save us from such hacks. Jack must have had tears in his eyes after looking at butchery like that. But, maybe I’m being a little too harsh with George. I do think this run fits the “continuous set of issues in a larger series that really help to re-define and elevate a title” criteria. I loved this run and sought it out in dollar bins well after the fact as well as the Michael Lark run which I even like better.As far as the cinematic treatment of Miller/Jansen goes, I can’t let that stand without a reference to Genial Gene Colan who made Captain America walking down a street deep in thought for about 6 pages look interesting.Or looking up from underneath a sewer grate for that matter. So true Dennis. No matter who else thrills me when they take the reins of Daredevil, I don`t think any of them capture that fluid dynamism of Gentleman Gene`s layouts. and, on the subject again of pencillers and inkers, I don`t think anybody did Colan`s work more justice than Tom Palmer. He was to Colan what Sinnot was to Kirby, and then some.